We’d love your help. Let us know what’s wrong with this preview of No Turning Back by Rania Abouzeid. Extending back to the first demonstrations of 2011, No Turning Back dissects the tangle of ideologies and allegiances that make up the Syrian conflict. As protests ignited in Daraa, some citizens were brimming with a sense of possibility. A privileged young man named Suleiman posted videos of the protests online, full of hope for justice and democracy. A father of two name Extending back to the first demonstrations of 2011, No Turning Back dissects the tangle of ideologies and allegiances that make up the Syrian conflict. As protests ignited in Daraa, some citizens were brimming with a sense of possibility. A privileged young man named Suleiman posted videos of the protests online, full of hope for justice and democracy. A father of two named Mohammad, secretly radicalized and newly released from prison, saw a darker opportunity in the unrest. When violence broke out in Homs, a poet named Abu Azzam became an unlikely commander in a Free Syrian Army militia. The regime’s brutal response disrupted a family in Idlib province, where a nine-year-old girl opened the door to a military raid that caused her father to flee. As the bombings increased and roads grew more dangerous, these people’s lives intertwined in unexpected ways. I can't help but wonder: Why are there only maybe 5% of GoodReads reviewers of "No Turning Back" male? I'm a guy who happened to catch NPR's Terri Gross' interview with the author and couldn't help but admire Rania Abouzeid who has a lot more courage, smarts, and whatever else than I. I plan on reading the book. Probably the best narrative nonfiction book written on the Syrian uprising to date, and the best about any war since Anand Gopal’s “No Good Men Among the Living”. The book interweaves the lives of a number of Syrians from different backgrounds, whose lived experiences make up a microcosm of the civil war as a whole. The author has language skills and intimate access to Syrians that puts her reporting above the vast majority of what has been written by others. I was also amazed by the incredible Probably the best narrative nonfiction book written on the Syrian uprising to date, and the best about any war since Anand Gopal’s “No Good Men Among the Living”. The book interweaves the lives of a number of Syrians from different backgrounds, whose lived experiences make up a microcosm of the civil war as a whole. The author has language skills and intimate access to Syrians that puts her reporting above the vast majority of what has been written by others. I was also amazed by the incredible elegance of the writing, which was literature quality at times. Through the lives she follows the entire arc of the revolution is documented: civil uprising, war, prison, exile, radicalization and survival. A very brave Arabic-speaking journalist followed Syrians -- families, poets, activists, politicians, Islamists, soldiers -- for six years, as their country blew up. She gives plenty of context, takes no sides, and lets them speak. This is the book on Syria I'd recommend to anyone who wants to understand what's been happening there. This book tells the story of the Syrian Civil War through portraits of Syrians. Author is an Arabic speaking journalist who was able to win the confidence her subjects. The interviews show the life before the war, the person’s role in the war and their reflections on it 6-7 years into it. It starts and ends with a businessman whose family benefited from the rule of Bashar al-Assad. Through Suleiman you learn the horrors of Assad’s prisons and how their conditions conflict with the regime’s descr This book tells the story of the Syrian Civil War through portraits of Syrians. Author is an Arabic speaking journalist who was able to win the confidence her subjects. The interviews show the life before the war, the person’s role in the war and their reflections on it 6-7 years into it. It starts and ends with a businessman whose family benefited from the rule of Bashar al-Assad. Through Suleiman you learn the horrors of Assad’s prisons and how their conditions conflict with the regime’s descriptions. Through others you see how the people’s protest for more rights was co-opted by the Islamists, the role of the Free Syrian Army and the divisions of the Al Qaeda and ISIS fighters. The book does not cover the supporters of Assad or how the regime internationalized its side of the war. The most interesting portraits, to me, were those of Ruha, a 9 year old who becomes a teenager in this period, Talal, an Alowite depressed over the loss of his family and his hostage-held daughter, and the update of Saleh living underground in Germany and is relieved to bus tables while reflecting on the horrors he saw and abetted. There are the sad stories of people returning to their uninhabitable homes, attending mass funerals and burials, escaping to Turkey, and describing how the war affected families and individuals. The economy is baffling. With nothing being produced and so much destroyed, where are the resources coming from? How does Talah have a perfume business in the midst of war? Ruha’s family has a farm, but there is little mention of the work or the crops. Although they lost a home and travel back and forth to Turkey they seem unconcerned about money. Her father somehow acquires the resources to build a factory. How does Suleiman keep his money throughout his prison stay (with all the thievery and graft, did the guards really keep it for him?) His family continues to have the money to support him. It seems that along the border there are whole communities of Syrians springing up. They are not living in camps. This may be as close as lay people can get to understanding the conflict from the perspective of the everyday Syrian. The conflict started with peaceful protests in hopes of more democracy only to have local battles became the stage for others fighting larger conflicts. Let them be eaten alive. the orphans chant at the enemy, "Let them be eaten alive." The war is still ongoing in Syria, in some pockets of the country. It is therefore an enormous challenge to write about this complex conflict without the benefit of hindsight. However, I believe that Rania Abouzeid did an absolutely amazing job at providing some key reference points for the reader to navigate through this all consuming at times contradictory period. She does so by detailing the day to day experience of Syrian war through the eyes of selected individuals, some very young some mat The war is still ongoing in Syria, in some pockets of the country. It is therefore an enormous challenge to write about this complex conflict without the benefit of hindsight. However, I believe that Rania Abouzeid did an absolutely amazing job at providing some key reference points for the reader to navigate through this all consuming at times contradictory period. She does so by detailing the day to day experience of Syrian war through the eyes of selected individuals, some very young some mature and some old, whom she follows through a period of at least 5 years if not longer (2010 to 2016/7), weaving a web of continuous narratives of specific men and women that over the years become familiar to the reader, and a prism through which they can understand the various factions and events on the ground. Not an easy feat in an ever changing war landscape. Daughters, fighters, rebels, government army defectors, refugees, imprisoned civilians, etc. For the first time, I have a sense of what the various factions are or were in Syria, a first albeit I am sure incomplete unravelling of what happened just a few miles from our shores. The humanity and the total respect of the individuals she demonstrates are a testament to her attempt at giving the world a first-hand account of what happened for some people in Syria. Some people on here have criticised her for writing at length about fighters involved with IS. But she also interviewed pro Assad individuals, Free Syrian Army fighters, and many more from other fighting groups within the country. She does not hold back in the description of the gruesome violence of torture and sheer murder that the Syrian people were subjected to from all sides. This book should be considered essential reading for anyone who wants to understand the war in Syria. Perhaps no other non-Syrian journalist has had the access and put in as much depth of research as Rania Abouzeid, a Lebanese-Australian journalist who has been covering the war from the beginning of the uprising, from inside and outside Syria. The book weaves together the narratives of several of the characters she met in that time, including an opposition activist jailed by the regime, a nine-y This book should be considered essential reading for anyone who wants to understand the war in Syria. Perhaps no other non-Syrian journalist has had the access and put in as much depth of research as Rania Abouzeid, a Lebanese-Australian journalist who has been covering the war from the beginning of the uprising, from inside and outside Syria. The book weaves together the narratives of several of the characters she met in that time, including an opposition activist jailed by the regime, a nine-year-old girl whose family flees the bombs in Saraqeb for Turkey, an Alawite whose wife and children were kidnapped by rebels, an al Nusra leader. While the majority of the reporting was done by necessity in rebel-controlled areas, as Abouzeid was branded a spy by the regime and banned from government-controlled Syria, she does her utmost to present a full and accurate picture of events, detailing the abuses and excesses both of the regime and of the various armed groups. In particular, her account of the rise of ISIS and al Nusra and the eventual splintering and fighting between the groups is illuminating, and her account of the characters involved in the groups lays out their views and motivations dispassionately, humanizing them without glorifying them. While focusing on personal stories, the book lays out the bigger picture as well, including the role of the various external actors in the conflict and the tensions between and within the secular and Islamist strains of the Syrian opposition. The book offers some hope for humanity in its detailing of the strength that people find to bear and survive the most extreme of circumstances. But it does not offer a great deal of hope for Syria as a nation. What it shows, in deeply researched and painstaking detail, is a society that has been shattered perhaps beyond any hope of repair in our lifetimes. The "happy ending" that some of the characters find in eventual escape to Europe is nevertheless a life of exile from which there will likely be no return. Abouzeid did kind of an amazing job explaining the incredibly complex subject that is the Syrian conflict (war, genocide, events, civil wars, revolutions?) -- see I don't even know what to call it and she wrote a book about it! Anyway, there are a lot of Arabic names and places and it all kind of jumbles in my English speaking Western brain, but Abouzeid followed a handful of key people from all sides and by interweaving their personal stories also told a larger story. She gave the same treatment Abouzeid did kind of an amazing job explaining the incredibly complex subject that is the Syrian conflict (war, genocide, events, civil wars, revolutions?) -- see I don't even know what to call it and she wrote a book about it! Anyway, there are a lot of Arabic names and places and it all kind of jumbles in my English speaking Western brain, but Abouzeid followed a handful of key people from all sides and by interweaving their personal stories also told a larger story. She gave the same treatment to the story of an al Qaeda terrorist as she did to a young girl who was a victim of war, which took amazing writing skills, but also gave a more clear picture of the complex forces at play and took any kind of political, national or religious agenda off the table. As a journalist, she is a force to be reckoned with. The Syrian conflict scares me more than ever -- the radicalization of a revolution, the global political intrigue (which only hurts the common people), the fact that at times al Qaeda seems to be the most rational actor. (Yes, I just typed that -- what has happened and is happening in Syria is unbelievable, just unbelievable). I think this is an important read for the U.S. as we really have *no* understanding of Middle East politics. This is a tough one for me to review. The subject matter is hard - rage-inducing, heartbreaking, nauseating. What the Syrians people have gone through in the last decade is absolutely appalling, and the failures of the international community to help in any meaningful way are shameful. I don’t think you can read this and not be horrified, angered, or gutted. Unfortunately, in addition to the difficult subject, the writing is textbook-dry. I had to switch to audiobook because I struggled to focus This is a tough one for me to review. The subject matter is hard - rage-inducing, heartbreaking, nauseating. What the Syrians people have gone through in the last decade is absolutely appalling, and the failures of the international community to help in any meaningful way are shameful. I don’t think you can read this and not be horrified, angered, or gutted. Unfortunately, in addition to the difficult subject, the writing is textbook-dry. I had to switch to audiobook because I struggled to focus and pay attention to the print. These stories are so important that it’s a shame they are written so coldly. This is an incredible book. Almost unbelievable how Rania Abouzeid has been able to get in contact with those key actors, gain their trust and be able to visit them and follow them throughout all these years. In extremely volatile and dangerous conditions, she has been sneaking in and out of Syria, on all sides, including extremist groups, without really getting into trouble. A miracle. At times I found it awkward to realize the author was there, when writing in the first person, in the midst of This is an incredible book. Almost unbelievable how Rania Abouzeid has been able to get in contact with those key actors, gain their trust and be able to visit them and follow them throughout all these years. In extremely volatile and dangerous conditions, she has been sneaking in and out of Syria, on all sides, including extremist groups, without really getting into trouble. A miracle. At times I found it awkward to realize the author was there, when writing in the first person, in the midst of war events. Abouzeid’s remarkable journalistic and literary work truly is an incredible achievement. The book itself is very well written, and allows the reader to feel and experience the struggle and the pain of the different protagonists. Abouzeid brings a hard but nuanced account of what happened on the ground, of how the peaceful and progressive protest got hijacked by islamists and the roles played by the regime and the international community. The book gives profound understanding of how people are finally attracted to extremist groups, of how they are forced to flee Syria and some end up in Europe. An extremely graphic, difficult read, but probably a necessary one for people like me who were too young/naive to pay attention to the start of the war in Syria. I’m... more horrified than I thought I could be. 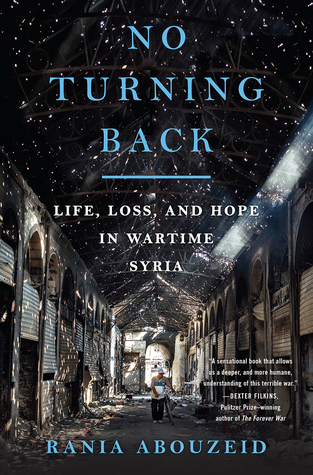 No Turning Back book gives a human element to the countless news stories, analyses, reports and documentaries I have watched and read since the Syrian Revolution started in 2011. Abouzeid tells the story of the revolution turned Islamic insurgency from almost all relevant angles (my one criticism is that there was no mention of the Kurds in the book). That said I cannot fault the author for the bravery she has showed in finding and telling these stories. As she notes in the afterward and through No Turning Back book gives a human element to the countless news stories, analyses, reports and documentaries I have watched and read since the Syrian Revolution started in 2011. Abouzeid tells the story of the revolution turned Islamic insurgency from almost all relevant angles (my one criticism is that there was no mention of the Kurds in the book). That said I cannot fault the author for the bravery she has showed in finding and telling these stories. As she notes in the afterward and throughout the book, Abouzeid entered war-torn Syria multiple times and put herself in dangerous places to gather the data. I thought she gave human stories and also some of the geopolitical information about the revolution in an effective manner. Ruha - a 9 year-old girl whose father helped finance the revolution from the town of Saraqeb which was heavily shelled by the regime. Abu Azzam - a commander in the Free Syrian Army, disillusioned with the infighting on his side and the Islamic takeover of the revolution. I want to thank the Goodreads Giveaway program as well as the W.W. Norton Co. for giving me the opportunity to read this book. If you want to know the story of Current day Syria, this book is a good place to start. Rania Abouzeid has done a great job taking you through from the peaceful demonstrations of early 2011, to the crackdowns and the Civil War itself. What makes this book, is that she does not do her reporting at the 10.000FT. Level, she lets the Syrian people tell the story. Through many I want to thank the Goodreads Giveaway program as well as the W.W. Norton Co. for giving me the opportunity to read this book. Through many voices you get you get the feel of protesting against an authoritarian regime. You then go onto the fighting, against not only the government; but also the internal struggles between factions w/in the opposition. The refugee issue, and just trying to stay alive is known, and at the end: What Now and how does it End? I saw this book discussed on CNN with host, Fareed Zakaria. "Rania Abouzeid brings readers deep inside Assad’s prisons, to covert meetings where foreign states and Added April 8, 2009. "Rania Abouzeid brings readers deep inside Assad’s prisons, to covert meetings where foreign states and organizations manipulated the rebels, and to the highest levels of Islamic militancy and the formation of ISIS. Based on more than five years of clandestine reporting on the front lines, No Turning Back is an utterly engrossing human drama full of vivid, indelible characters that shows how hope can flourish even amid one of the twenty-first century’s greatest humanitarian disasters." Very eye opening and informative. A must-read on the Syrian tragedy. Exceptionally well researched and comprehensive in its coverage. I would say that this is a fair account of the war. She does not take sides and it describes atrocities by every faction in the Syrian war. It makes me feel lucky that I was living in Damascus for the first 3.5 years of the war and not in any other city as to be honest we were cosseted by comparison and did not suffer even a fraction of what those she writes about suffered elsewhere. That is not to say that I did not lose many friends and students to the war but still mild by comparison. I think I would say that this is a fair account of the war. She does not take sides and it describes atrocities by every faction in the Syrian war. It makes me feel lucky that I was living in Damascus for the first 3.5 years of the war and not in any other city as to be honest we were cosseted by comparison and did not suffer even a fraction of what those she writes about suffered elsewhere. That is not to say that I did not lose many friends and students to the war but still mild by comparison. I think this is a good account and worthwhile reading. It takes it a chapter at a time covering many different characters and how each was affected by the war. It seems to leave on a note where there should be more being told but then as I write this the civil war is still not officially over. It is dying out and many of those who fled Syria I believe are returning but it is still not safe. Once it is safe I myself, a foreigner, who fell in love with the country and made it my home will return. I wish to die in Syria to me it feels like my home. I am living in Cairo but feel that this is a hiatus in my life until one day I return to my home. Remarkable journalism by Rania Abouzeid, who spent years in Syria and Lebanon reporting on the lives of the people involved in Syria's civil war. I have never read a book where the amount of work and sacrifice to make it was so clear. You should read this book next. It’s stunning and depressing and enlightening and ongoing. Wow, these stories. Listened on audiobook, paused a lot to look up various noms de grrr and re-Levant terms (it's Hazzm Movement, not Hasm Movement). From protests to prisons, coming of age to surviving air raids, and the nuance that comes with choosing jihad in civil war, when options abound of who to fight for or against, the threads of Suloimon, Muhammad, Roha, Abu Azzam, and each of their extended families are stories well worth listening to. This book is more personal history than comprehens Wow, these stories. Listened on audiobook, paused a lot to look up various noms de grrr and re-Levant terms (it's Hazzm Movement, not Hasm Movement). From protests to prisons, coming of age to surviving air raids, and the nuance that comes with choosing jihad in civil war, when options abound of who to fight for or against, the threads of Suloimon, Muhammad, Roha, Abu Azzam, and each of their extended families are stories well worth listening to. This book is more personal history than comprehensive history. But there is much historical context provided all throughout the chronologically organized book, establishing for the reader a timeline of the events of the war in Syria, as well as the relevant history of Syria under Hafez, of Syrians in Al-Qaeda in Iraq, of poems of wine in the Umayyad Caliphate. Not just one of the best pieces of writing on Syria but one of the best book-length pieces of journalism I've read. She's physically present for so many of these events, yet it can take a long time to realise that. It contrasts massively with other books where journalists are simply recounting what they've been told and somehow seem to constantly remind you of their presence. Rania Abouzeid has won the Michael Kelly Award and George Polk Award for foreign reporting, among many other prizes for international journalism. She has written for The New Yorker, Time, Foreign Affairs, Politico, the Guardian, and the Los Angeles Times. A former New America fellow, she lives in Beirut, Lebanon.